In the 1840s, the women who gained experience in the abolitionist movement became leaders of the emerging women’s rights movement. During this era, states were repealing laws that required voters to own land, which increased the number of white male voters. Women, however, were not allowed to cast a ballot. In response, male and female activists began to meet and petition for women’s rights, including the right to vote. We hold these truths to be self-evident; that all men and women are created equal. In the 1840s, the women who gained experience in the abolitionist movement became leaders of the emerging women’s rights movement. Many of the laws of coverture were still in place: their husbands controlled their finances, children, and property. Women did not have equal access to education. During that era, states were repealing laws that required voters to own land, which increased the number of white male voters. Women, however, were not allowed to cast a ballot. In response, male and female activists began to meet and petition for women’s rights, including the right to vote. In 1848, Lucretia Mott, Elizabeth Cady Stanton, and several other women decided to call a women’s rights meeting in Seneca Falls, New York. About 300 people—including the former slave and prominent reformer Frederick Douglass—attended. The Seneca Falls meeting was not the first in support of women’s rights, but suffragists later viewed it as the meeting that launched the suffrage movement. 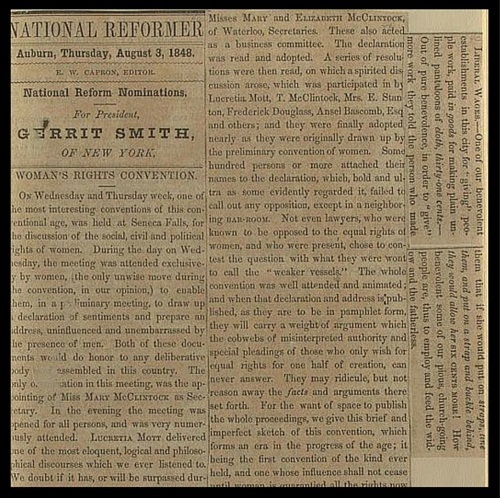 The group voted on a set of resolutions—the Declaration of Sentiments—written by Stanton. She modeled her Declaration after Thomas Jefferson’s Declaration of Independence. She asserted: “all men and women are created equal,” a provocative statement at that time. The Declaration of Sentiments called for a long list of women’s rights: access to education and job opportunities, more power within the church, and the right to control one’s own property and money. Woman suffrage (a woman’s right to vote) was the most controversial resolution. The suffrage clause was the only one that attendees did not unanimously adopt. While the vote was not originally the main goal of the reformers, suffrage became central to the women’s rights movement in the 1860s. What was the role of Seneca Falls in the origins of the woman's rights movements? What did the meeting call for? What were the precursors to this meeting? How did it affect organization afterward? During the Woman’s Rights Convention, held at Seneca Falls from July 19th to 20th in 1848, the Declaration of Sentiments was accepted. It was written by Elizabeth Cady Stanton and rewrote the Declaration of Independence to include women; “We hold these truths to be self-evident: that all men and women are created equal…” Additionally, it showed how the United States government had oppressed women by not granting them rights that all men had been given.